Portugal have a wealth of talent in their ranks at every age level - but how could their team look by the time the 2022 World Cup comes around? Predicting the stars of the future can, in some instances, be very straightforward; youngsters that are already progressing to the main stage and showing the confidence and raw ability required to make it to the top are easy to identify as future world beaters. A clear example of such a player is João Filipe, nowadays more commonly known as Jota. It feels like the 19 year old winger has been on the scene for as long as time, showing the potential to be a world-class player since he first entered the Benfica youth academy several years ago. And yet, still, Jota has not played a single senior league game for his club. Not one. His only appearance for Benfica came this season, a 4 minute stint in the Portuguese Cup against lowly Sertanense. And yet, still, there’s an air of inevitability about Filipe going on to be one of the greatest players in world football. Of course, Filipe is still only 19 years of age, and there’s a long way to go for him to reach the top of the game. But he is undoubtedly in prime position to become one of Portugal’s star players over the next decade or so. But, names also pop out of nowhere; football can often be very unpredictable. Sometimes those you expect to progress very quickly falter, while others develop much more rapidly than anticipated. As such, it is never easy to predict how the national team will shape up in a few years time. Injury troubles, rapid loss of form or a single bad transfer and suddenly one of the country’s most gifted players may instantly be brushed to the sidelines, out of contention completely. (..) Number in brackets indicate the player’s age for the 2022 World Cup. 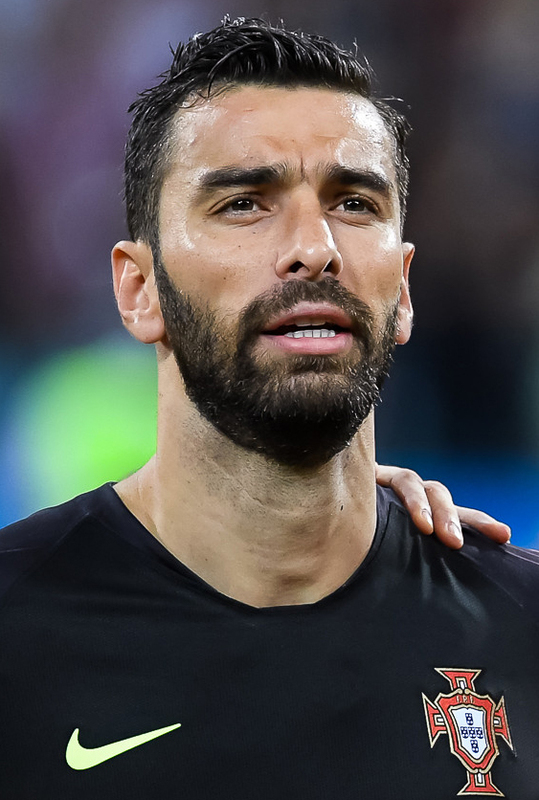 Rui PATRICIO (34): Aged 34, Patricio is still very likely to be Portugal’s number one goalkeeper, let alone included in the squad. Currently at Wolves, Patricio has been doing a splendid job in the English Premier League, and is expected to lead the side for many years to come. Anthony LOPES (32): By 2022, Lopes will be 32 years of age, the perfect age for an international goalkeeper. Lopes has been Patricio’s understudy for a while now, and the Champions League shot-stopper is expected to continue to fill that roll by the next World Cup. Diogo COSTA (23): Iker Casillas has himself described Costa as his successor at FC Porto, the Portugal U21 international expected to eventually take the reigns at both club and national level once the experienced Patricio and Casillas eventually retire. And at the next World Cup, Costa should be beginning to do just that, by this time 23 years of age and likely Porto’s number one between the sticks. It may, of course, prove to be a tournament too soon for the U17 and U19 European champions, but one thing’s for sure - he’s a future Portugal international. Rui Patricio at the 2018 World Cup. Author: Анна Нэсси. License: https://creativecommons.org/licenses/by-sa/3.0/deed.en. João CANCELO (28): The Juventus man has gone from strength to strength over the last year or so. After missing out on the World Cup squad in 2016, Cancelo has quickly made that right back position his own, and doesn’t look likely to give it up any time soon despite the incredible depth Portugal possess in that area of the pitch. Cancelo, aged 28, is fully anticipated to be included in the 2022 World Cup squad - and be the first choice on the right side of defence. Diogo DALOT (23): Nelson Semedo, Ricardo Pereira and Cedric Soares are all current internationals and worthy candidates to make the squad for the 2022 World Cup. Aged 29, 29 and 31 respectively by the time the next World Cup comes around, they will be at an excellent age to serve as understudy to Cancelo. However, Manchester United youngster Diogo Dalot, who will be aged 23 for the tournament, is perhaps the most likely player to be called up, the next three years expected to be huge for the former Porto right back. Ruben DIAS (25): One thing seems an absolute certainty regarding the Portugal national team; Ruben Dias will play a huge part in any future tournaments for the country, and will not only be included in the 2022 World Cup squad, but will be one of the first names on the team sheet. By that time 25 years of age, the Benfica defender will be in the perfect position to take over from national hero Pepe, who will likely have retired from international football by the time the sport’s biggest football competition comes back around. Diogo LEITE (23): Who will be called up alongside Ruben Dias remains far less obvious. With centreback something of a weak point for the country, it is difficult to predict who will be the successors of the likes of Bruno Alves, Jose Fonte and Pepe. One player that is likely to be bursting onto the scene by Qatar 2022, though, is Porto’s Diogo Leite. There’s a huge deal of excitement surrounding the U21 international, who was even given the number 4 shirt at club level and played the entirety of Porto’s first three league matches this campaign, even playing the full 90 minutes of Porto’s Champions League victory over Galatasaray. By 2022, the 19-year old will be 23, and should should see him being integrated into the senior squad. FERRO (25): Despite currently being 21, two years older than Diogo Leite, Ferro has yet to play a single match for Benfica, having spent his entire career playing for the Benfica B team. However, there’s a great deal of optimism surrounding the U21 international, who shouldn’t have to wait too long now to start getting some first team football. Having witnessed how quickly Ruben Dias made the progression up to the Portugal senior side, Ferro should no doubt be in and around the Portugal main team by 2022, by which time he would be 25 years of age. Pedro MENDES (32): By 2022, Pepe will be 39, Bruno Alves will be 40 and Jose Fonte will be 38. There’s no doubt that at least one of them could still do a good job for the Portugal national team should they still be playing by the next World Cup, Pepe perhaps being the most likely, although 2022 is likely the moment where we see the passing of the baton with regards to Portugal’s centrebacks. Montpellier’s Pedro Mendes seems to be Fernando Santos’ current preferred choice as the immediate successor to Bruno Alves, and he’ll likely still be in the squad come the next World Cup, aged 32. Ruben VINAGRE (23): Onto left back then, and this another position that remains a little more uncertain for the Portugal national team, with Guerreiro highly injury prone, Kevin Rodrigues struggling for regular game time and Mario Rui somewhat limited as a footballer and potentially set to lose his place in the Napoli starting eleven with Ghoulam returning from injury. It will therefore be interesting to see how Portugal’s left back situation develops over the next 3 years. One thing is for sure though; Ruben Vinagre is a future Portugal left back, and his time could be as soon as 2022, where he will still only be 23 years of age. Raphael GUERREIRO (29): As already mentioned, Guerreiro’s injury troubles make him something of an unpredictable entity when it comes to his standing in the Portugal national team. If he manages to put all of his fitness issues behind him, he’s guaranteed to be involved in the Portugal national team for the rest of his career, but if he continues to struggle to get sufficient game time and stay injury-free, he could see his career at international level take a hit. Difficult to call, but Guerreiro, aged 29 by Qatar 2022, is certainly in contention for a place in the squad. Ruben NEVES (26): Portugal are spoilt for choice when it comes to midfielders, with incredible depth in this area of the pitch. Wolves star Ruben Neves is a certainty to be in Portugal’s squad come 2022 though, surely even guaranteed a starting berth, with his potential clear for all to see as soon as he arrived at Porto all those years ago. By 2022, Neves will still only be 26, likely only by this point approaching his peak performance level, and he will be one of the first names on the team sheet for his country. William CARVALHO (30): Carvalho has already played for his country 53 times at senior level, and yet is still only 26 years of age. With two World Cup’s still in him, Carvalho will surely be another current international to be included in the squad for Qatar 2022, his composure, strength and defensive game invaluable to the national side. The current Betis central midfielder will be 30 by the time the next World Cup comes around. Danilo PEREIRA (31): Defensive midfielder Danilo Pereira is the man that kept Ruben Neves out of the team at Porto, and the 27-year old is another current international expected to be involved with the Portugal setup for many years to come. Missing out on the last World Cup squad due to injury, he and William Carvalho constitute two outstanding options in defensive midfield, and the argument as to who is better of the two continues to be the source of serious debate amongst many Selecao supporters. Ultimately though, we’re very fortunate to have them both, and, should fitness prevail, both should be included in the 2022 squad. Gedson FERNANDES (24): Benfica youngster Gedson has well and truly been integrated into the Benfica senior side this season and, as such, has already earned two caps for the senior national side, both coming at the end of last year when he was just 19 years of age. By 2022, he’ll be 24, and you wouldn’t bet against him being one of the names in the squad for the next World Cup. Renato SANCHES (25): The 2016 Golden Boy played a significant role in helping Portugal to European glory in France two years ago when aged just 19, and his strength, dribbling prowess and footballing intelligence is clear for all to see. 2016 was a huge year for Sanches, who has had a tough couple of seasons since, and the Bayern Munich midfielder is expected to play a big role in the Portugal team for years to come. He’ll still only be 25 by Qatar 2022, and is surely going to be included in the squad should Portugal qualify. João FELIX (23): The teenage superstar was only introduced to the Benfica senior side this season, and he has already had a huge impact on the team. His dribbling and confidence has been a sight to behold, and his awareness on the football pitch mirrors experience beyond his youthful years. Benfica’s youth academy appears to be the future of Portuguese football, and Felix, like Gedson, Ferro and Ruben Dias, is another current youngster expected to lead the line for the country for many years to come, starting no later than 2022. Bruno FERNANDES (28): And to round off the midfield category, we have another experienced current international in Bruno Fernandes. The Sporting attacking midfielder has been a revelation since returning to Portugal in 2017, and you wouldn’t be surprised if he was another player to be included in the 2022 squad. Of course, there are several other players that haven’t been included in this hypothetical squad that should be in discussion. Joao Mario and Andre Gomes will both only be 29 come the next World Cup and are two other players that could be in contention to be included in the squad. Gonçalo GUEDES (25): The Valencia winger had a sensational season last campaign, although his World Cup efforts last summer fell short of our expectations. However, it is easy to forget that the left winger is still only 22, such is the talent he has already demonstrated for both Benfica and Valencia, and he will only improve from here. He is expected to be one of the stars of the national team in the years to come, reflected by the fact that 70 million euros has already been spent on his services in total, and he is a certainty for the 2022 World Cup. João FILIPE (23): Another player, another Benfica youth product. We’ve already spoken quite extensively about this little magician at the start of the article and, despite him having yet made an appearance for the Benfica senior side - bar, of course, that 4 minute cameo in a Portuguese Cup tie - he is expected to make a very loud and very rapid burst onto the scene in the not-too-distant future. When he does, European giants will swoop in to snap up the young star - which could explain why Benfica are so reluctant to play him in the main team yet. BRUMA (28): Bruma is the type of player that can change the game in an instance. The pacey winger is a constant threat in behind the defence and is the type of player that can be utilised either from the start or from the bench that can flip a game on its head. He was another player unfortunate to miss out on the last World Cup squad, but is expected to play far more often for Portugal now, and is a real possibility to make the 2022 World Cup team should he contineu to progress as he has been doing at RB Leipzig. Rony LOPES (26): Like Bruma, Lopes also missed out on the World Cup squad, perhaps the most unfortunate player in all of world football to do so. After finishing the season having played all 38 league games for Monaco, Lopes scored 15 goals and assisted 7 as he helped his French side to 2nd place in the league table, leading Monaco to Champions League qualification and the ‘best of the rest’ in the French game. It is no coincidence that his long-term injury this season has coincided with a complete capitulation from Monaco, who currently sit in the relegation zone without the talented right winger to call upon. Expect him, aged 26, to play for Portugal in Qatar in three years time. Bernardo SILVA (28): Bernardo has continued to dazzle fans of the Premier League with his incredible dribbling and technique since arriving at Manchester City, quickly becoming one of their most valuable assets in what is a team filled with outstanding talents, and is expected to be the man to lead Portugal into the post-Ronaldo era. He is aruably Portugal’s most influential players after the Juventus striker, and aged 28, is guaranteed to be in the 2022 World Cup squad (barring injury, of course). Rafael LEÃO (23): When Leão left Sporting to go to Lille, eyebrows were raised as to whether that was the correct decision for the young Portuguese star. Lille, having just escaped relegation by a single point last season, seemed a strange destination for a player considered to be the future striker of the national team, and was something of a gamble for the 19 year old. It seems to have paid off though, having scored 3 goals in his last 3 outings and finally looking as if he is settling into the team and progressing as a player. Helping Lille to a shock 2nd place position in the French league, we may even see him in the Champions League next season. If he continues as he has done recently, he’ll be in Qatar in three years, that seems a certainty. Andre SILVA (27): To round off the team, we have, of course, Andre Silva. Portugal have lacked an out-and-out star striker over the years, but Andre Silva fills that role beautifully, being the poacher and focal point in attack that national team’s in the past have lacked. He’s still only 23 years old, with 3 World Cup’s left in him still, and should be leading the line for Portugal come 2022. Goalkeepers: Rui Patricio (34), Anthony Lopes (32), Diogo Costa (23). Defenders: João Cancelo (28), Diogo Dalot (23), Ruben Dias (25), Diogo Leite (23), Pedro Mendes (32), Ferro (25), Ruben Vinagre (23), Raphael Guerreiro (29). Midfielders: Ruben Neves (26), William Carvalho (30), Danilo Pereira (31), Gedson Fernandes (24), Renato Sanches (25), João Felix (23), Bruno Fernandes (28). Forwards: Gonçalo Guedes (25), João Filipe (23), Bruma (28), Rony Lopes (26), Bernardo Silva (28), Rafael Leão (23), Andre Silva (27). Full XI: Rui Patricio (34); João Cancelo (28), Ruben Dias (25), Diogo Leite (23), Ruben Vinagre (23); Ruben Neves (26), William Carvalho (30), João Felix (23); Bernardo Silva (28), João Filipe (23), Andre Silva (27).